If you are asking yourself how can I watch the Tour de France from a censored country go no further, this is a must read. The Tour de France. Le Tour. By all accounts the single greatest sporting event on the planet. The world’s toughest athletes spend 21 days in the saddle, 3 weeks of their lives, pushing themselves to the limits over a course in excess of 2,000 miles and all for the sake of glory. The Tour is the world’s longest, hardest, fastest bike race. It requires men who can perform at peak output for hours at a time, day after day, and still have a bit left at the end to sprint for a finish. The course is hard, many of the roads are paved with cobbles centuries old, and it is hot. France in July, especially along the southern routes, can produce temperatures in excess of 100 degrees, hot enough to melt the pavement. Flat stages are long, often 225 miles or more in a single day. Mountain stages are high, and steep, including the most famous passes in the Alps and Pyrenees. To finish a rider must be able to ride both, to win he must be able to finish near the front in all stages. What channel is the Tour de France on, where to watch Tour de France online? The Tour only allows one station to cover the race, the French national station. Watch Tour de France live here (with our French VPN server or HybridVPN). They pipe live broadcasts to partner stations around the world including the BBC and Discovery Channel which both have streaming coverage. If you are outside one of those countries you can use a personal VPN service to watch Tour de France as if you were in France. The Tour is a stage race. One of the three Grand Tours of Europe including the Giro de Italia and Vuelta Espana and comprised of 21 stages. The format from year to year can vary to include a prologue and 20 stages or 21 regular stages. Of those at least 18 are group starts, usually 2 and up to 4 stages may be time trials, either individual or team based. The prologue, if they have one, is always a time trial and used to set ranking for the field, or included at the whim of race organizers. It is typically a short stage, the shortest of them all, and in the range of 10 or 20 miles depending on the year. This year the 1st stage is a time trial prologue of 14KM or about 8.5 miles. The other time trials are usually longer and can take an hour or more to complete. These stages require the riders to pedal at full tilt if they want to win and are often used to solidify leads, regain time or to send a message to rival riders or teams. A rider in a time trial has only himself to rely on, there are no teammates to help pace, carry water or attack break-aways so are especially taxing. The remainder of the stages falls into two primary categories with little in between: flat and mountain. The race route alternates from year to year, starting in the northwest, from counter-clockwise to clockwise. The first stage, or prologue, may sometimes be set in or start in another country. Belgium, Holland and England are common choices, but in 2017 Tour started in Germany. From there the route sets of for the first week in a series of flat stages as the riders head towards the mountains. In the early stages riders are focused on setting a good pace but not the fastest pace of the race, and on staying safe. All too often a crash in an early stage can mean the end of a contender’s chances of winning. Tyler Hamilton broke his collarbone in two places in stage one of the 2003 Tour. He went on to finish the race in 4th position over all including a stage win in the mountains. Others have not been so lucky. A crash in the first stages of the race mean riding for weeks at an aggressive pace with road rash, contusions and broken bones. Assuming a counter clockwise route, as is the case in 2017, the riders will hit the Alps first. The Alps contain some of Europe’s highest and steepest mountains, the Tour tries to hit as many of them as possible. When it comes to the riders and the race, this is where the men get separated from the boys. The passes they ride through are over 4,000 meters with gradients as steep as 20% in some places and on average 10% or more. Riders without the heart, lungs, legs and mental fortitude to power over the mountains get dropped, if they don’t finish a stage within the time limit they are disqualified from the race. Even those who do finish within the limit may find themselves hour(s) behind the leaders. Roads in the mountains are less than adequate and not well maintained. Located far from population centers and often damaged by ice, snow, rain, rockslides and other forces of nature they receive only the bare minimum of care. These roads are often only one lane wide, crumbling and made of antiquated materials not designed for smooth bicycle riding. Elevations are also steep. The riders may gain thousands of feet in elevation in only a few miles through a series of tight switchbacks. Between the Alps and the Pyrenees is the South of France. Here riders enjoy blistering hot temperatures and flat stages, often plagued by winds, which may blow in less than beneficial directions. A strong side wind will have the group of riders spread out in a long, thin, diagonal line called the echelon. Riders in the front will have the worst of it, fighting against the wind, while those in the back will have a much easier time. The Pyrenees are at once welcome and feared. In the case of this year’s race they signal the end is near, but to get there you have to cross the highest and steepest of the high, steep mountains. Each Tour has two scheduled rest days for the riders. The irony is that the riders spend the day riding. If they don’t do “recovery rides” their muscles will begin to heal which can cause tightness and cramping. From the Pyrenees the route turns north and leads the riders to the outskirts of Paris and the final stage. The final stage is always the same. The riders start in the suburbs of Paris, ride into town and hit the Champs Elysees. When they enter the Champs Elysees they begin a circuit of 6 laps up and down the avenue. The road is cobbled and crowded, the winner of the race often long decided, but still leaves a chance for team and personal glory. Riders at the front of a stage can expect to be featured prominently on TV and there is always the chance for a stage win. Winning the Tour is a complicated affair and not everyone rides it for the same reasons. The Tour itself is one race with one winner, the winner of the GC or general classification. This is the man who finishes the entire race with the lowest elapsed time. Each stage is treated as an individual race however, with a winner, runner up and third place finisher. It may take the winner 70 or 80 hours to complete the entire event, the smallest margin between first and second ever recorded was 8 seconds. The man who leads the race is awarded a Yellow Jersey, called the maillot jaune or “mellow Johnny”, to symbolize his lead. The jersey usually changes hands several times throughout the race and is by far the most popular contest. Important terms to be aware of include Peloton, tête de la course, breakaway, attack, and off-the-back. What they all have in common is that they refer to different groups of riders in the race and their position relative to the leader. The Peloton is the main group, the mass of racers. For the most part the Peloton will stay together but windy or mountainous conditions can break it up. When the Peloton breaks up the leaders are called the Tête de la Course. If the Peloton breaks up because a group of riders increased their pace it is called a breakaway. Within the breakaway if a rider or a smaller group of riders tries to breakaway from the lead group it is called an attack. Attacks happen a lot, particularly during the mountain stages and towards the end of the race. Off-the-back is something you never want to be. This means that the Peloton has managed to leave you behind, if you don’t catch up in time you could be eliminated. Each stage has designated feed zones. These are areas where the team support staff can hand out bags of food and drinks to the riders. All other food must be carried by the riders, food handed outside the zones can incur penalties. Food includes small sandwiches, power bars, gels and candy bars. Beverages include water, sport drinks and sodas. The average rider will burn more than 6,000 calories during the race alone. Within the Tour there are 6 sub-races going on including the race for the GC victory. These include the Green Jersey, the White Jersey, the Polka Dot Jersey, most combative rider and the team competition. The Green Jersey is awarded to the fastest sprinter of the race. During the flat stages, because there is no sprinting in the mountains, race organizers set up intermediate sprint lines. Points are awarded for crossing the line, those who cross first getting more points than those who don’t, and the man with the most accumulated points at the end of a stage wins the Green for that day. The White Jersey is awarded based on time and given to the best rider under 25 years old. This competition recognizes athleticism in the younger riders, riders who don’t have enough miles on their legs to truly compete for the GC win. For those in the know, the White Jersey winners and contenders are often the GC riders of future tours. The Polka Dot Jersey is for the climbers, those riders who excel at the high mountain passes and can be counted on to be near the front in every stage. The mountains, like the flat stages, have intermediate point lines located at the tops of climbs along each day’s route. The rider who crosses first wins the most points, the one with the most accumulated points at the end of each day wins the Jersey. The Most Combative rider is a less easy classification to define. It is a combination of aggressiveness tempered by good sportsmanship. The rider to win this award will be seen at the front of the race more often than not, pushing the Peloton to go further faster, trying for the win whenever he can. He will also be known throughout the Peloton as a good sportsman and not one to rely on shady tactics. Flicking is the practice of using your elbows to stop, hinder or push-off of the man beside you. It is not uncommon for less well-liked riders to fall under the pressure of repeated flicking. A man not liked by the Peloponnese can’t win in those conditions. The Team Competition is just the like the GC but is counted on elapsed time for the team, not the individual. Each team has 9 men, race rules say the first five men over the line count. When it comes to the race the team is what it is all about. You may be able to win the race but you can’t do it without your teammates. Here is a quick run-down on the types of riders you might find on a single Tour de France team. This is the rider most likely to win the race and may even be a favorite or past race winner. He will be a strong rider on the flats as well as in the mountains, is likely to win a stage or two, is likely to win a Green or Polka Dot Jersey along the way and the most protected by the team and team tactics. The sprinter is the man most likely to win in a bunch-sprint. Bunch-sprints occur in the flat stages when the Peloton reaches the finishes line as a group. Riders in the sprint will rely on a lead-out man to pace them into the final meters when the sprinter will unleash a violent burst of energy enabling him to reach speeds in excess of 65 kilometers per hour. Sprinters may also fill other roles within the team when there are no sprint points to be had, they may also drop out of the race or get dropped from the race when the Peloton reaches the high mountains. The lead out man is another strong rider but not the sprint favorite. He will ride along the sprinter near the front of the race as the Peloton approaches the finish. His job is to keep the sprinter safe from crashes and other riders, to put pressure on other teams by setting a high pace and to provide a pace rider for the sprinter to draft behind on the way into the finish line. The lead out man may also fill other roles on the team. The climber is a strong rider, accustomed to riding in hilly and mountainous terrain, but not a strong sprinter per se or a necessarily a GC Man. The climber can be expected to finish with the Peloton on a flat stage and to shine in the mountains where he can be seen at the front of the race or even winning the stage. Along the way the Climber’s job is to pace the GC Man to the top, keep him safe and to attack the front of the group forcing them to ride faster than they may want to. This is a position for younger riders or those new to the tour. It allows them a chance to ride the tour, get a feel for the conditions and most importantly, help condition their bodies so they can race competitively at some point in the future. They are not a sprinter or a climber, likely to be dropped in the mountains or to drop out of the race before the end, but an important member of the team while present. The domestique’s job is to take care of the other riders. They carry extra water and food for the race leaders, they go back to the team car to pick up supplies, they may sacrifice their bike to a better rider after a crash and generally are expected to put themselves between the Peloton and the team’s top riders. As complex as the race is watching it is pretty easy. It comes on TV live every day, broadcasted by France’s national television network. The race is available on partner stations in some countries but where not accessible there are alternatives. For me VPN to watch the Tour de France is the only solution. VPN stands for virtual private network and are the three most important letters in Internet security. VPNs plug holes left by firewalls, antivirus and anti-malware with the added benefit of unlocking geo-restricted content worldwide. They work by masking IP addresses which gives users the ability to make their computers appear to be located in a country of their choice. When it comes to how to watch the Tour de France from outside France, this is the way to go. The best part is that top-rated services like Le VPN cost less than $5 a month. 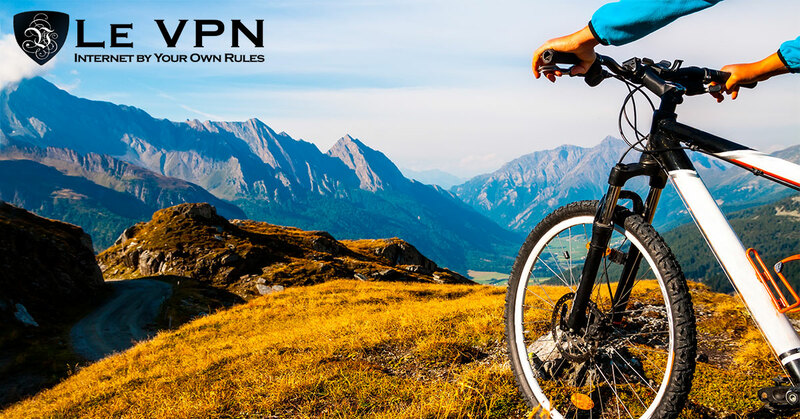 Le VPN has three different protocols including a HybridVPN, which is designed specifically for streaming content over the Internet and unblock France’s national television network that broadcasts the Tour de France. While I’m on the subject of benefits the VPN will also bypass your local ISP servers which means they won’t be able to throttle your speeds or block your connections, allowing you to watch every action packed pedal stroke of the Tour. Article updated on July 8th, 2018.